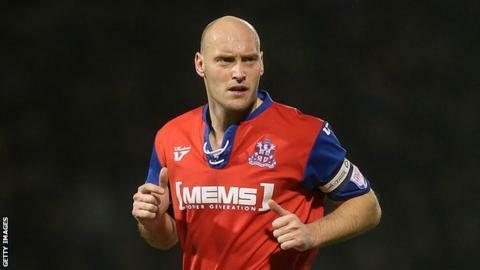 Gillingham captain Adam Barrett says the club must improve their home form. The Gills, who are one point behind League Two leaders Port Vale, have only won one of their last seven league games at Priestfield. The defender told BBC Radio Kent: "We had such a fantastic start here and were scoring a lot of goals. "Away from home we have been so strong. We want to put the home form right. We are having a fantastic season and we need to make sure we kick on." The 33-year-old centre-back added: "As we were top for so long, teams come here and make it hard for you. "We have probably struggled breaking them down or getting the early goal and then they hit you on the counter attack." We have 17 games to go and we want to make sure we get promotion this season. Gillingham missed the chance to move back to the top of the table following a 1-0 home defeat by Wycombe on Monday night. The Kent club have now lost five of their 16 home league games this season, but have only been beaten once on the road. "We have been a very solid unit away from home," the former Southend and Bournemouth player continued. "It's not just us. There are a lot of teams whose away records are better. "We'd love it to be the other way around but if you are putting points on the board that's all that matters. "We are in a great position. We are second in the table, one point off the top, and you'd have bitten someone's hand off for that [at the start of the season]." Gillingham manager Martin Allen has called on his squad to try and put their problems at home behind them. "At home we are finding it difficult, let's not hide behind the curtains," he said. "It is difficult for us to find the wins at home and performances for 95 minutes. "That's something we have to face up to, deal with and help our players to get better at. "We have seen other clubs where there home form has been shocking and it does affect people. "It's how we deal with it, cope with it, manage ourselves and deal with the setbacks. "We have to dust ourselves down and address the issues that have to be addressed. "It doesn't bug me - it's part of the job. These are the tests you face over 10 months."